The system which is responsible for heating and cooling, HVAC system is one of the most essential part of your home. HVAC stands for Heating, Ventilation and Air Conditioning, which are the main functions necessary for a comfortable home. To provide comfort to your place, these systems primarily allow you to control the air temperature, helping you regulate the heating and cooling, to compensate the season you are in, may it be winter or summer. Aside from air temperature, this system can also control humidity and intake of fresh air. Thus, maintaining the air’s quality in your home. HVAC systems come in different categories and types, may it be from a small window-unit, to a central cooling/heating system. Window-units can accommodate a small room, whereas central cooling/heating systems can provide comfort to a whole house or even a building. 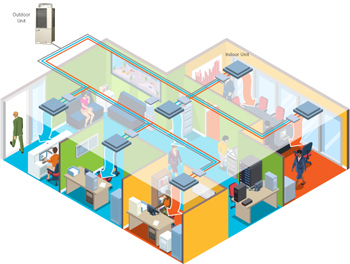 What the central cooling and heating system does is it produce the cool/warm air in one central area, then distributes it throughout the building or your home. There are several components to an HVAC system. The largest component is the outdoor unit. There is also an indoor unit, where the cooling cools and blower are located. You will also find the filter located on the indoor unit, as well. Another main component of an HVAC system is the ductwork. These are the lines that bring the conditioned air to each room of your home. Usually, the ductwork will be either under the home or in the attic, keeping the lines out of sight. There are many parts to your ductwork: the main supply is the main trunk that carries the highest volume of air. Side branches allow each room in your home to be heated or cooled. Since most of these systems are based on forced air systems, distribution of air would be through ducts. While not all systems are forced air, there are also radiant systems that make use of boilers in the creation of heat and deliver it through the radiators throughout the building.Generally speaking, an HVAC system have several components. Essential products that comprise the central system includes heat pumps, air conditioners, gas/oil furnaces, fan coils, evaporator coils, the controls and thermostats. Heat pumps use outside air to either cool a home in summer, or heat it in winter. Air-conditioners on the other hand is responsible for altering the temperature of air and its humidity, to a more favorable condition. Also called boilers, furnaces can generate heat by burning of oil or gas fuel. Fan coils are essential for regulating movement of air. Evaporator coils on the other hand allows the cooling agent to evaporate from liquid to gas while absorbing the heat. To adjust the settings of your system and maximize its performance, the controls and thermostats allow you to manage the temperature, timings, humidity, and ventilation. Not all HVAC systems are equal. Although all of them abide to federal guidelines and requirements in performance, not all of them however have the same efficiency and quality. The higher the efficiency of the system, of course, the lesser the wasted energy, and the higher the performance of your system. In choosing your HVAC system, for energy saving and greater comfort, you should primarily take into consideration the quality and efficiency of the system. HVAC Duct work and accessories Saudi Arabia.